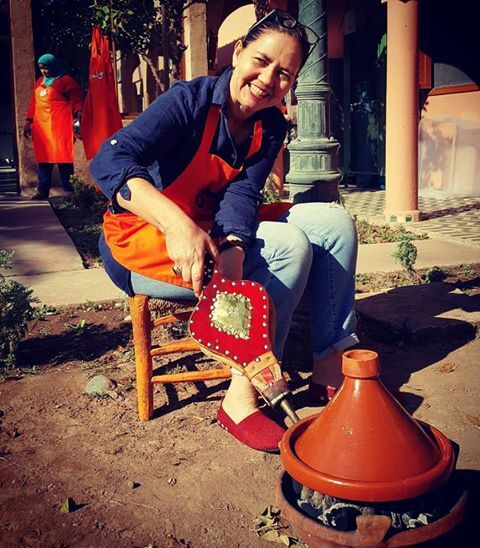 I spent a wonderful morning at Amal Women’s Training Centre when I was in Marrakech a few months ago, learning to cook my favourite Moroccan dish . . . 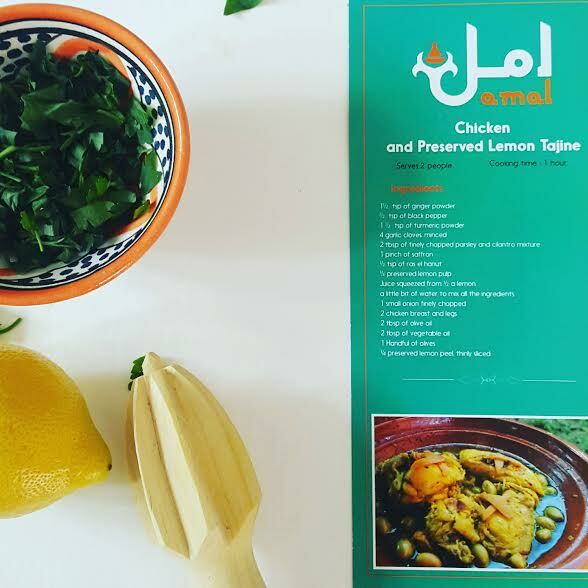 Lemon Chicken Tagine. It is a great project and one definitely worth supporting, so thought I would take the time to tell you a bit about it and suggest you put it firmly on your itinerary if you are planning a trip to The Red City! It is the brainchild of Nora Fitzgerald who remains the director of this non-profit association, and is dedicated to the empowerment of disadvantaged women through restaurant training and job placement. 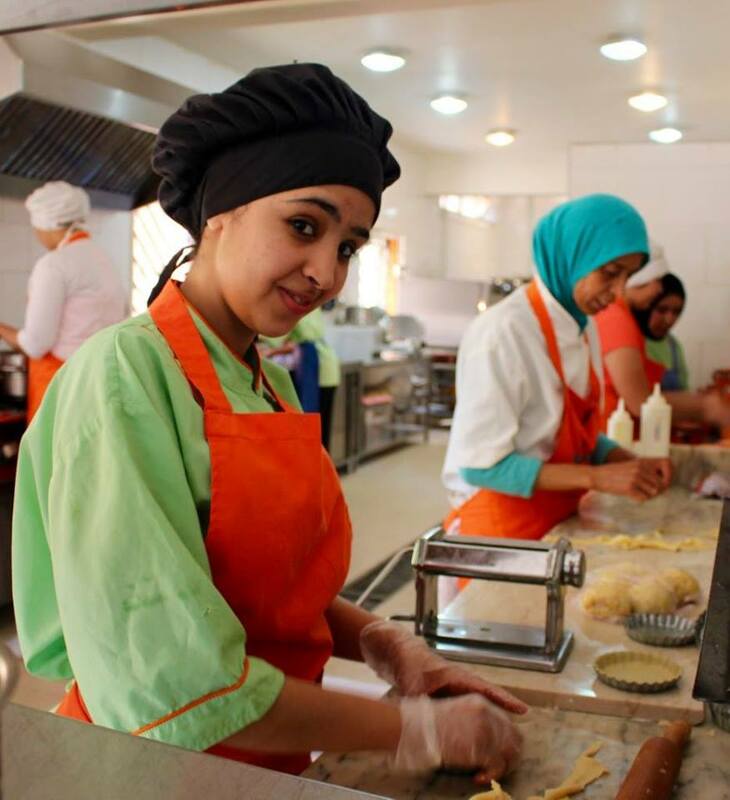 Part of this training takes place in their restaurant which is open to public while the courses contribute towards the funding of the project. 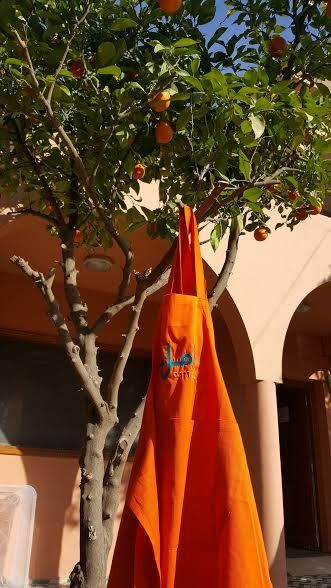 Once we had plucked our aprons from the branches of the orange tree, the morning started off with a brief and interesting explanation of the organisation, its aims, and how it works. After a walk around the garden, picking fresh herbs for our mint tea, we got stuck into the recipe – chopping and mixing fresh ingredients and herbs, all accompanied by an explanation of the tastes and cooking traditions of Morocco. And bellows in hand we even stoked the fires for our own tagines! Of course the colour coordination of shoes with bellows was intentional! 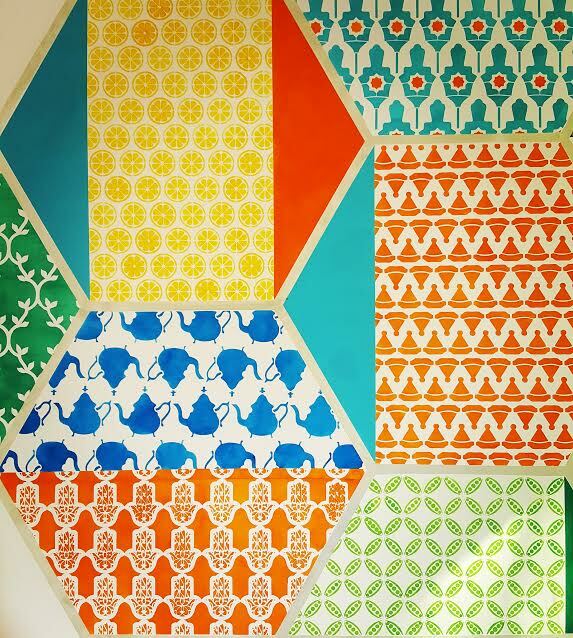 And, as an interior designer by trade, I have to mention that the kitchen where the courses are run, is a lovely light filled space, with this great colourful design stencilled on the walls! But enough of the pretty stuff – what is important is the work being done by this centre.Their training provides women from some of the most disadvantaged communities, a chance to gain new skills and ultimately secure a job. 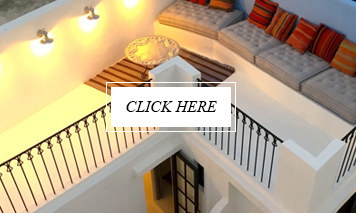 Have a look at their website to find out more about what they do, and if you don’t have the time or inclination to attend one of the cooking courses you can still support them by enjoying a meal at their Restaurant in Gueliz. 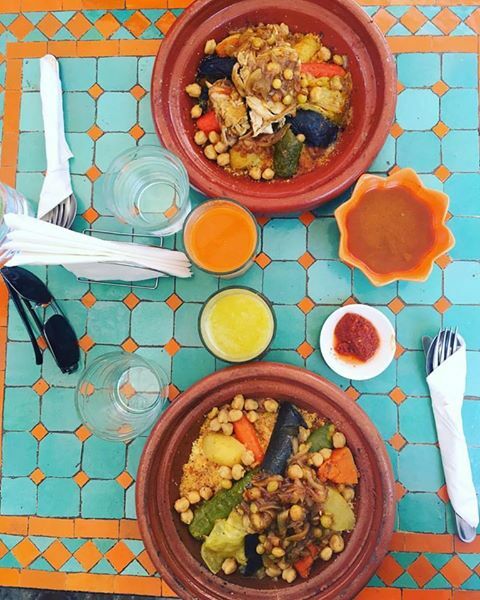 if you find yourself in Marrakech during this month of Ramadan they are open for Iftar every evening from 19:00!